If you are a salaried individual, I am sure your are aware of different types of LEAVES like casual leave, earned leave, sick leave, personal leave etc., Sometimes, you may not avail all the leaves that are available to you and some of your leaves may remain unused. In this post let us understand – When leave encashment is provided? Is leave encashment taxable? What is the tax exemption limit on Leave Encashment? What are the tax implications of Leave Encashment? What are the rules on leave encashment for Government & non-government (Private) employees? How leave encashment is calculated (formula)? at the time of Termination of the employee. During the period of employment / service, if an employee encashes any leaves, the entire LC amount is fully taxable. At the time of retirement or separation or resignation, LC is fully exempted from Income Tax. At the time of termination of employee, it is fully taxable. Any leave encashed during the period of employment / service is fully taxable. Actual Leave encashment amount that has been received by an employee. At the time of termination, it is fully taxable. The tax treatment and implications of LC are pretty clear regarding a Govt employee. However, regarding LC by a non-govt employee, we need to do some calculations w.r.t ‘cash equivalent of leaves’ (point no 4). ‘Y’ is No of completed Years of service (you need to exclude part of an year, if any). ‘C’ is total no of leaves Credited per year. If company provides 40 leaves per year, for calculation purpose we need to take 30 leaves only. ‘A’ is total no of leaves Availed during the service (total no of leaves minus no of leaves that were encashed). ‘S’ is average salary for last 10 months. If leaves are credited at the rate of say 55 days leave for each year of service then calculation shall be made at the rate of 30 days leave only for each year of service . If, however, earned leave is credited at the rate of say 25 days leave for each year of service, calculation shall be made at the rate of 25 days leave for each year of service (w.rt. above ‘cash equivalent of leave’ calculation). Exemption limit of Rs. 3 lakh is the maximum that a taxpayer can claim in a lifetime. If you have claimed a tax exemption of Rs 1,00,000 during a financial year on receipt of leave encashment then a maximum exemption of Rs 2,00,000 can only be claimed in the future years. If you receive LC from two or more employers in the same year, then the aggregate amount of leave salary exempt from tax cannot exceed Rs 3,00,000. Leave encashment received by your nominee / legal heir is not taxable. 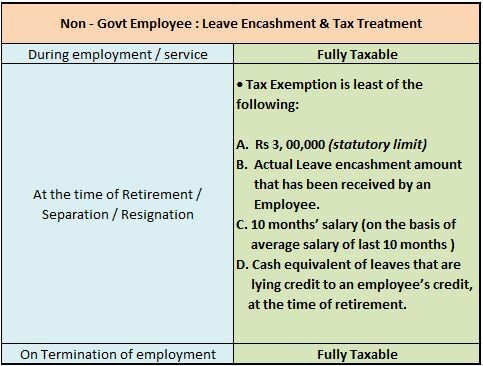 In case of Non-Govt employees, LC received at the time of resignation or retirement is either fully or partially (as explained above) exempted from Income Tax. For example – If leave encashment is Rs 3 Lakh (received by a pvt employee on resignation) and the exemption is say Rs 1 Lakh (as per above calculation) then Rs 2 Lakh is taxable (as per your income tax slab rate) and Rs 1 Lakh is exempted. You can find Details of your Leave Encashment in Final settlement document / Salary Certificate / Form 16. Under Section 17 (1) you can find ‘LC’ amount and details regarding the Leave Encashment exemption can be found under section 10 (10 AAA). Below is a sample of salary certificate.
) for next year(2017-18) can be allowed as a expenses for computation of income tax in 2016-17 or not. please guide me ,when that leave encashment will be allowed as expenses in income tax. please explain me from employer or company point of view. Dear kranthi ..I do not have correct answer from employer view point. You may consult a CA. Dear Ajay Ji ..Kindly refer to our conversation on Facebook. Can you please let me know, what will be the treatment of Leave Encashment on Employee incase he Switched to the another branch of Company. Ex: An employee is working in Pvt ltd. Company from 1st April to 31st December 2016, on 2nd January 2017, some of the employees are transferred to another company. Current company agrees to Pay Leave Encashment amount as Joining Bonus. 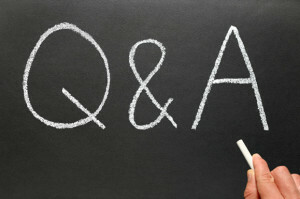 Will it be Taxable on part of Employee? If it is treated as a different company then the rules can be applicable as mentioned in the above article. Dear Gaurav ..Its basic salary + commission. Just want to have a clarity, if an employee has not completed his one year in the organisation but leave encashment is paid in his F&F, will it be fully taxable or he is eligible to get the exmption under income tax? This is resigned case. Dear Kumar..It depends on your ex-companies policies. There is no statutory compulsion to have Leave Encashment Policy. Thank you Sir for providing requisite information. I shall be thankful to you to if you please guide me regarding my leave encasement matter posted on August 22, 2016. Kindly go through this pdf document (source : personnel ministry, Govt of India) , refer Page no 15, Click here to download the document. I have retired from Bank on August 31, 2015. Bank is to pay leave encashment of 240 days as per rules. One day salary multiply by 240. What is the rule which I should provide to HR people to take the base as 30 days in a month. They want written guidelines/ rule in this regard. In my opinion it should be as Salary for the month of August 2015 divided by 30= one day salary. There is a scenario in my company. There are few employees deputed in subsidiary company from parent company while being on the roll of parent company only. due to some structural changes and regulations, these employees are resigning from parent company and joining susdiary company. Employees want their leaves be encashed on index value rather than on current basic salary to compensate losses. pl advice at the earliest. I am not sure about this. Kindly consult with a CA/CS. I am working in Pvt. company, I have checked my offer latter Leave encashment added part of CTC. please let me know is it correct? Dear MANJUNATH ..Yes, it can be part of your salary structure. where in form16(part A/part B) can i found details about leave encashment and under which tab..? Dear Abhilash ..Kindly read: Form 16 – complete details. Hello Mr. Shreekanth Reddy. Accidently I came through this site and really like it. Thanks for posting this type of information. Can I ask you to advice me on my scenario, please? I resigned from my government (Class 3 – Non teaching) job after 13 years of service. I received my Provident Fund amount only as my benefits. What are the other government benefits am I supposed to receive, Ex. leave encashment, pension if eligible etc. I have good no of leaves but i was not benefited. Can you please shade some light on this, particulary on leave encashment. If yes how can i get benefited? You may kindly contact your employer regarding the salary benefits that are applicable to you. now that income will be counted in which year salary?? That can be considered as salary arrears received which you may have to account for in AY 2017-18. Do i need to fill ITR2A for Leave Encashment or ITR1. I have got leave encashment for less than 30 days after resigning from my job and now I don’t see any option during e-filling in Income Tax Website. It is part of your salary and if taxable can be shown under the head ‘income from salary’. Can Leave Encashment Exemption be claimed more than once. Like If i had already claimed when i resigned from previous employer then can i claim once again when i am switching to another job. I sought VRS on 30th Sept 2015 and received leave encashment on retirement amounting to Rs. 631000/- and was given benefit of 300000 as exempt from tax. 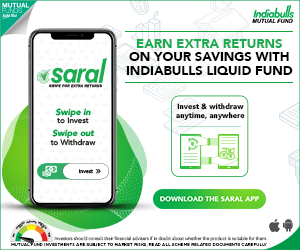 Please guide me whether rebate amount of 300000 is to be shown in Form 16A or not. Dear PREM ..Kindly note that Form 16A is a statement containing all details of TDS Deducted on all Payments except Salary. Read: Understanding Form 16, Form 16A & Form 26AS. My relative was an employee of PSU(An enterprise of UP Govt.) retired in Dec2014. After retirement he got amount Rs.13,91,400.00 as Leave encasement. Department deducted 20% TDS and he has also submitted 10% as TDS to incometax Department (total 30% on Leave encashment Amount). Is above Leave Encasement amount taxable or not.If not taxable please tell me the procedures to get refund. Kindly provide detail calculation sheet / steps if possible. Dear omprakash..Kindly take help of a Chartered Accountant and get this done. In Haryana CBSE Affiliated Private School After Joining When Eligible For Earn Leave? Please Explain How Many CL, EL For Teachers, Admin Staff, Non Teaching Staff. At a time How many CL CAN TAKE? I have joined one privet company from march 2016 and i want to know that can i put casual leave & earned leave in may 2016. Dear GYANENDER..Kindly contact your company’s HR dept. I have resigned from private company after completing 6 years service. Company provides 30 PL, 9 sick and 9 casual leave for each year of service. Casual leave is not allowed to carry forward. Any CL balance will be encashed in Jan and considered as ataxeble income for that year. Sick leave is allowed to carry forward upto maximum of 45 days. As 31 st May is my last day, our Administration dept has given me the details of leave encashment tax calculation. The total leve credited is 30 * 6 = 180 days. 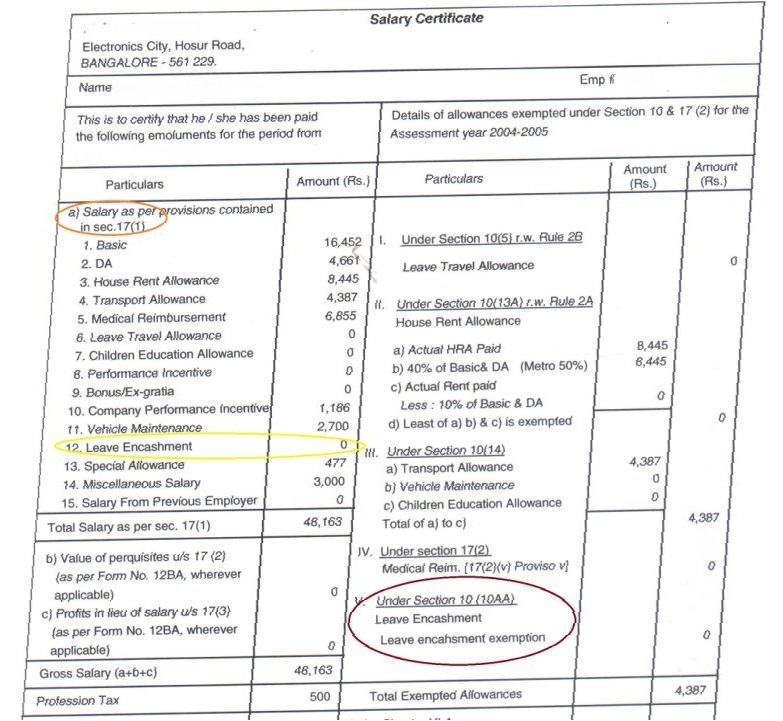 So tax examption amont is 180-157 =23 * per day salary ( baic + DA) being the least. Company has the policy to take compalsary 15 days PL if not it will get lapsed. In this case is the above calculation is right ? I fell they should not consider sick leave and 15 days PL which is compalsary while considering leave availed during service period. I resigned my Job in FEB 2016 (FY 15-16) and My leave encashment amount and other F&F delivered to me on APR8, 2016 (FY 2016-17). I am wondering, Why my HR added this leave encasement money as a income of FY 2015-16, and My Tax slab shoot up to 30%, on whole. Is that right? How i can approach my HR. You may kindly calculate the tax exemption amount on LE. In case if they have prepared F&F without considering the tax exempted amount, you may calculate accordingly (refer to the formula in the article) and can claim refund (if any) while filing your ITR. The amount exempted as per the formula, done correctly. Remaining amount added as a income of the Financial year FY15-16. As i received this amount on APR 8, 2016, I am wondering , why this my HR added the remaining Leave encased amount as the income of 15-16. Please advice how to approach.. If you have received the LE in this FY 2016-17, then you can show it in your AY 2017-18 ITR. You may kindly follow it up with your employer. “Leave encashment is the part of your FNF which was processed in the month of March 16 and deducted TDS has been deposited to authority and accordingly TDS return has been filed and Form 16 has been issued. Can you suggest the Act Number, which will me to justify my stand to my employer. Because, I received the leave encasement money and F&F(final settlement) on Apr 8th, 2016, But employer deducted TDS/Tax and calculated FY 2015-16 and Added to my Form 16 o AY 16-17. Also Please advice the next step..
Dear Kiruba..Tricky one. Does the TDS amount in Form 26AS reflects the same date (April)?? Please guide me if I am take leave encasement during employment then it’s taxable or non taxable. I think it not taxable u/s 10(10AA). Dear Deepak..Any leave encashed during the period of employment / service is fully taxable. You have calculate ‘Cash equivalent of leave at the time of retirement or resignation’ here..
Kindly refer to the formula given in the article. Please also let me know will it be right approach to take the no. of days of the current month as base in which leave encashment is settled, meaning can we take 31 days as base if settling in January and 28 days as base if settling in February. Dear Monika..You may have to take 30 days as the base. Please clearify me that employees of Punjab State Power Corporation Limited are Covered under PUNJAB GOVT. employees for the purpose of calculating tax on leave salary received on retirement. Dear Manish..During the period of employment / service, if an employee encashes any leaves, the entire LC amount is fully taxable. sir,I am serving in BRO (GREF) under govt of india.My enrollment is 25.05.1985.I want voluntery retirement on Nov 2016.My leave balance is EL 172 and HPL is 143.Pl intimate my calculation of leave encashment. I am working for a NON Govt organization. I switched job after 7 years in a private company. The company paid me 59 days’ leave encashment on actual salary. However, the tax exemption (under section 10) was calculated only on basic salary. Is it correct? Is only basic salary considered for leave encashment exemption calculation? Dear SD.. Yes, definition of ‘Salary’ for Leave Encashment : Salary = Basic salary + Dearness Allowance + Commission only. how to calculate leave salary and leave encashment (after 3 years of Service period) based only on Basic salary? Maximum Paid leaves given are 18 days. Leave salary is inclusive in CTC. How to manage the two employee with same CTC, same service period with one employee consuming PL (1.5 days per month) and other employee is not using Paid leaves? what will be their monthly gross salary and monthly basic salary? CTC is 6.0 lacs per annum. i worked in an govt organization for 10 months and then joined another organization. Will i get leave encashment ? Is it possible to cancel the encasement of the leaves thoroughly posted. My employee was on on sick leave but he did not inform the organisation for how many days he will be on leaves, and was also not telling us when he will resume his services. Well he resumed his services after 17 days, and he just worked for 13 days.Can you please advice how should I calculate his salary. I do not want to deduct unnecessary deduction.But would like to follow the process.So that it would also be in organisation and employee’s favour! Kindly follow your company’s HR rules & guidelines. What is your company’s Leave policy? If employees are moved from Parent Company to an Subsidiary company. As part of this, Leave pending is encashed. Will that be eligible for 10(10aa) exemption. Basic + DA component. Will this be treated as still in service ? or be treated as Retirement/Resignation. Dear Karthik..If they are two different companies, ideally it would be treated as resignation. Are you being transferred on a permenant basis or on deputation. You may discuss with your parent company if benefits like gratuity / Leave encashment etc can be transferred? Or is it going to be totally a new employment? (The general practice I have seen in good companies is to have employees in a holding company and send them on deputation to subsidiaries. That way the liability of gratuity and statutory dues stays with the holding company even if paid off by a subsidiary. The companies give a letter to the employee clarifying that the deputation will not be considered as break in service with the parent company and will be counted as such for gratuity, superannuation fund, increment, grades and seniority. Yes, its two different company . Not on deputation. We are permanently moved. We received new offer letter. But our Gratuity and Service continuity is taken care. PF balance is getting transferred, we have filed new forms. I hope i can claim the Leave Encashment of Basic + DA . Treating the scenario as resignation case. So that i can claim during next year filing. Currently they have taken all the 100% as income and considered for tax deduction. thanks for your quick revert. Yes, you case can be a ‘resignation type’ one, and accordingly you can claim tax benefits during next AY 2016-17. My previous employer shown leave encashement amount under taxable income in PART B. But my TDS paid by current employer is considering the leave encashment as non taxable. So deducting the LC amount from previous income and filling wont cause any issues ? If the LC amount received by you is tax exempted, then you can calculate your net tax liability accordingly and file ITR. It won’t be an issue. I have one query regarding the leave encashment recovery (as excess leave is consumed, deduction is there). Is this recovery amount is to be deducted from Total salary for income tax calculation purpose or not? If so can you provide the rules and sections? I did not understand your query. Could you please elaborate it with an example?? My previous Employer has put my Leaves Encahsed under the head “Taxable Income” and thus leaves enacashed have also been taxed. Moreover, there is no option to as exemption under 10AA wherein I can claim this exemption while filling online ITR. What should I do now? Dear Raj…Did you receive the LC during your employment? Are you still in service? Which ITR form are you filing? I received the LC when I resigned from my organisation to join other organisation. Yes, I am still in service and I am filling ITR – 1 online. Dear Raj..If you LC is taxable, you can add it to your salary and show it in ITR1 under gross salary. Dear Raj…LC can be totally or partially exempted from income tax. Kindly go through the article. Do the calculations. If the LC received by you is totally exempted (as per calculations) then you can claim it u/s 10a, else it is taxed as per your income tax rate. Thanks for your response. Online ITR doesn’t have any section for mentioning exemption for 10 (a). Any other to claim the same? You can deduct amount (section 10a) from your gross salary and the net amount you can show under ‘income from salary’. Thanks Shree for all your inputs. Just one final query, if I am deducting the amount from taxable salary, will it lead to any contradiction as 26AS will reflect taxable income inclusive of the leaves encahsed amount. Will there be any legal hassle? Dear Raj..It shouldn’t be an issue. Hi, Very fine article. I need your help in Various types of Leaves & how proceeds in various companies (private only) & how benefits to employees & employer. Never looked at my Final settlement statement so closely on this aspect. Thanks Sreekanth for throwing light on this topic. Very informative article.